I got so behind with my reviews and realized I fell down on keeping up with my reviews of Tess and her many adventures. This one is almost a five star read. I marked it down one star since I thought the whole why behind one of the villains doing this was a reach. And I mean a really big reach. It also doesn't make sense why this person involved Tess in this. I did love the fact the action takes Tess away from Maryland. It allows us to see how she does in another location. Tess is still fast on her feet and not willing to let things go even when she should. This book also brings a resolution to her relationship with her ex, Crow. Tess is still smarting from being foolish and letting her ex Crow go. Though she thinks she has gotten better in the almost year apart they have experienced, she still has pangs. When she gets a cutout from a newspaper saying In Big Trouble, Tess wonders if Crow is alright. When she is asked by his parents to track him down and let them know if he is okay, Tess reluctantly takes the case. Tess in Texas is funny at times. She misses Baltimore and feels a bit lost while in San Antonio trying to track down Crow. The characters Tess comes across are unique and interesting. I did have a hard time with her taking her dog though. Come on. The mystery aspect of things kicks into high gear when Tess finds a dead body and all signs points to Crow as the murderer. With bodies dropping, things seem to be looping back to an old case of kidnapping and also a multiple murdering incident that still haunts some of the characters in this story. I loved seeing Jackie and Tess's Aunt Kitty in this one (only briefly). We have Jackie settling in with her new life raising her adopted daughter. Kitty seems to be moving onto something long-term too which has Tess horrified (I loved who the new love interest is) and pretending it's not happening. 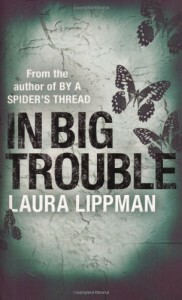 The writing was typical Lippman. I feel like I know Tess and even though I would have told Crow to pound sand after a while, I get why Tess keeps trying to save him. The flow was pretty good, not too bad until almost the end where it felt like too many coincidences kept happening. Moving the setting from Baltimore to San Antonio was interesting, but was happy to see Tess back in familiar surroundings in the next book.